We are used to see a lot of product, logos, brands on TV and movies, it’s no wonder this strategy is very common in entertainment contents. Known as “product placement”, this business was estimated at $6.7 billion in 2013. But today we are talking exactly about the oposite strategy: That is hiding real brands not to relate them with some contents. Some producers even spend lots of money hiring best corporate and packaginng designers just to design fake brands. What airline would show its planes crashing and burning in front of a marvelous firework chaos? It might sound a little silly at the beginning… Who would hide his brand or his products if you can show them in the screen to a huge audience? The answer is: Nobody. But there are some cases in which hiding the real products or logos is a must if you want to keep your brand reputation. One of the best examples in history of cinema is the air disaster movie. Of course producers need a plane in the set to make their movie, but which airline would lend its planes to show them crashing and burning in front of a marvelous firework chaos. 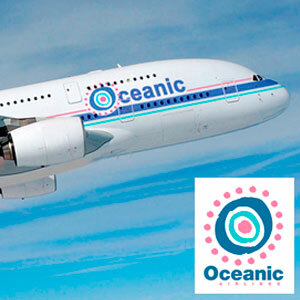 So, here comes one of the most famous fictional brand design: Oceanic Airlines. This original brand identity design is world-wide known for its relevance in LOST. Nevertheless it has appered in more than twenty movies and programs not to show real airline brands involved into air disasters. Morley Cigarettes and Heisler Beer were the answer to the needs of producers to show cool brands while drinking or smoking. Alcohol and tobacco companies have been affected by similar problems. Not often do this companies reject to show their products on the screen, however there are some cases in which those companies don’t want to show their attactive bottles or their relaxing cigarettes. Drunken bastards, idiots, loosers, murderers… There isn’t any good effect relating your product to them. Morley Cigarettes and Heisler Beer were the answer to the needs of producers to show cool brands while drinking or smoking. As I said in my last article about original branding design on TV and movies, some of this brands are much better than real ones. And it happens the same when we analyse this two brands. Anyone would drink an icy Heisler enjoying a barbecue with my friends; and trust me, there wouldn’t be any problem to start smoking if someone offered me a Morley cigarette. Oh yeah, I love this Hollywood branding gurus.